The convenience, speed and accuracy of this tool make my former concentration on short-term savings foolish . . . penny-wise and pound foolish as they say. By spending a little more (a good set of wet stones and guide start at about $250), we have saved thousands in time and labor. 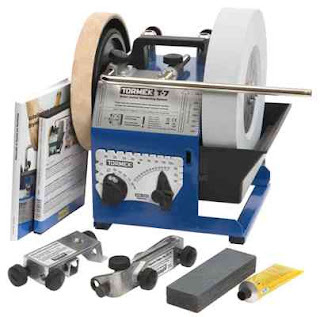 We have the Tormek T-7 in stock. You have sharpening to do and Father's Day gifts to buy, so order your T-7 today.